This issue of CDU’s enews begins a series of profiles of speakers at the forthcoming Charles Darwin Symposium, Securing Territorians’ Rights: Statehood and a Bill of Rights? 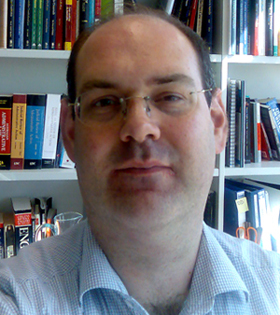 Among the national guest speakers is Associate Professor Simon Evans, Director of the Centre for Comparative Constitutional Studies, Faculty of Law, at the University of Melbourne. Dr Evans researches and teaches in constitutional law and constitutional theory and human rights. His particular fields of research are constitutional and statutory human rights protection, especially in the Commonwealth, the constitutional limits on redistribution and regulation of property, and the mechanisms for ensuring the accountability of the executive government. He has published widely on these topics in Australia and overseas. For the past three years Dr Evans has been working with Associate Professor Carolyn Evans on an ARC-funded project on Australian parliaments and the Protection of Human Rights. Before coming to the University of Melbourne in 1999, he studied at the universities of Sydney and Cambridge and worked as an associate to Sir Anthony Mason at the High Court of Australia and as a solicitor at Mallesons Stephen Jaques in Sydney. His paper will offer some reflections on a Human Rights Act for the Territory, and examine the broader issue of what are human rights. He will also explore the more specific issue of what rights a Territory Human Rights Act should protect. And how such an Act would work. As the abstract for his paper explains: ‘The experience of legislative human rights acts now implemented in the ACT and Victoria provides useful guidance on the shape of a Territory Human Rights Act that fits within the Australian constitutional context. The public is invited to attend the Charles Darwin Symposium in the Mal Nairn lecture theatre on May 10.